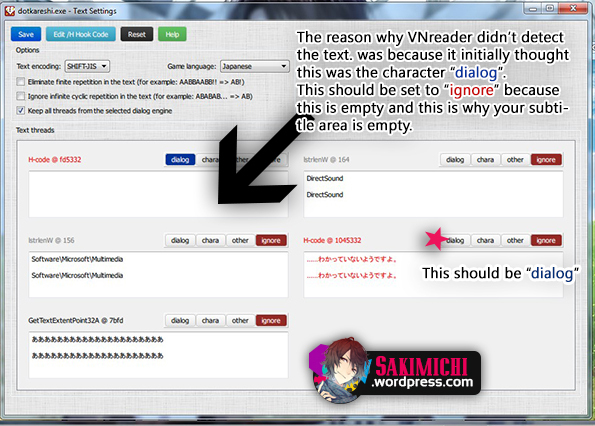 What is Visual Novel Reader? 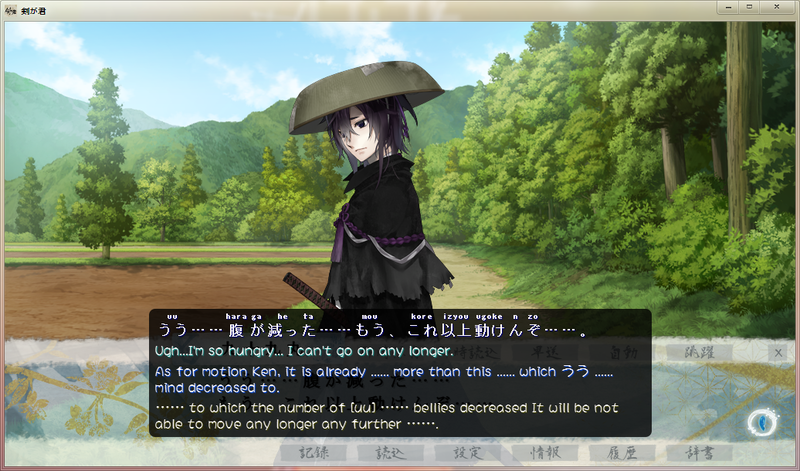 Visual Novel Reader helps adding soft subtitles to PC visual novels without the need of hacking and patching. This wonderful program was created by Jichi at Sakuradite. People could easily add translations, and it is hosted online (cloud). 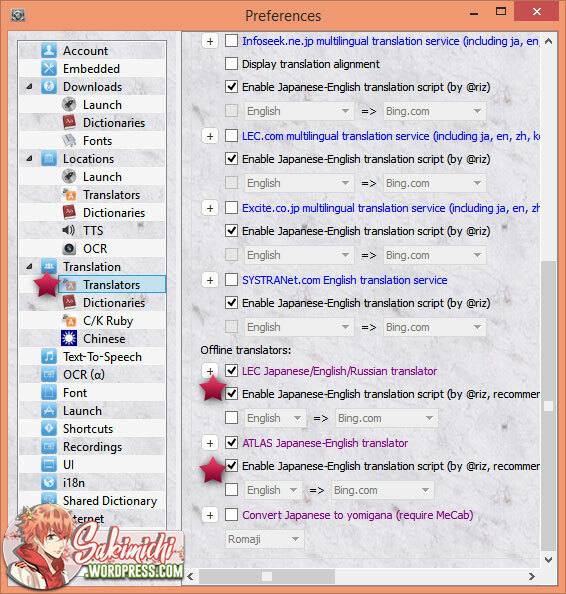 It’s primarily a translation tool for translators to submit their translation and it is a software to translate a visual novel if you don’t know how to read JP language. If you are using Visual Novel Reader but you are not a translator, do not expect a perfect translation if you are choosing “Machine translation” from ATLAS and GOOGLE. That should be obvious. but there are ways to improve machine translation. 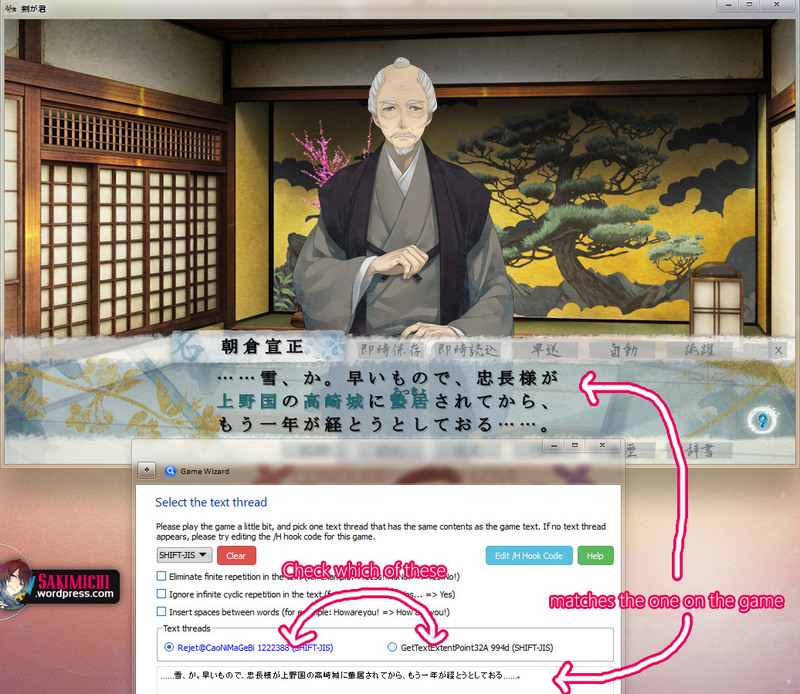 To find out if a translator has picked it up as a project, proceed to otomehearts (for otome games) . 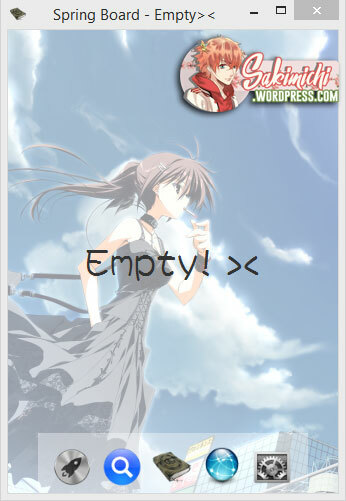 This is an update to my old VN Reader tutorial. Many people screwed up in the registration, logging in and adding subtitles, so I’m being very detailed about this. Please pay extra attention. If you need help that is not covered in this tutorial, there are links below for your convenience. 7/11/2014 Re-directed users to VNR official forums for support and feedback instead. 8/6/2014: Vietnamese translation by Ushiromiya Beatrice. 1/2/2018: Updated to the new VNR mod. Please delete the old VNR and instead download the latest version at vnr.aniclan.com. 1. )Create an account at VNR@Aniclan. Click “Create Account”. In the registration Language field select “Aнглийский” for English language or “мандарин” for Mandarin. The site will ask if you have an existing sakuradite account (the old VNR site), if yes, then it will sync, if not then it’s fine. Do note that if you register with an existing sakuradite account, use a new username. Your old username is still in the database for record keeping so all you need to do is use a new username. 2. )After registration you need to sign-in. Notice that there is a “What now?” section in the sidebar navigation. Click the link to download the latest VNR version. 3. )Download and install ATLAS version 14 and LEC version 15. To use the ATLAS activation/crack, change your computer date to 2014, replace the file in the crack folder to the installation directory. Run ATLAS then exit. Update the computerdate to the present afterwards. 4. 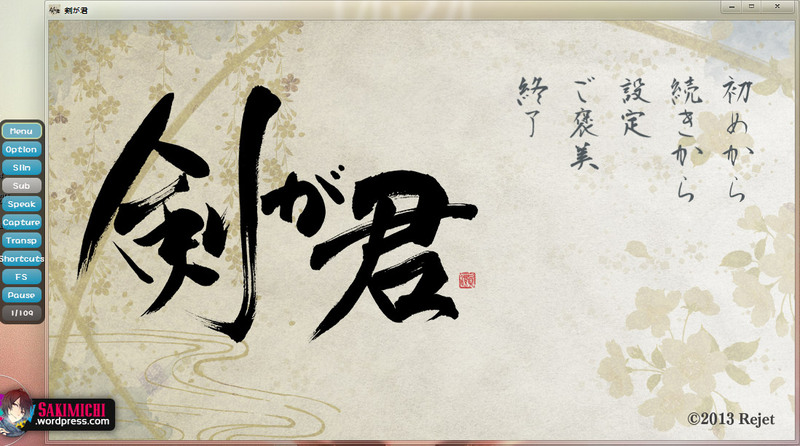 )Open the Visual Novel Reader folder. Before I could introduce you to all the functions of VN Reader; We must first prioritize on updating the program so everything would run smoothly. 1. )Double click “Update.exe” and follow the instructions to update. It’s usually press any key to continue. This takes a while, depending on your internet connection. It would take a while for the program to start up, have patience. Clicking everywhere might crash the whole thing. 3. )This is the “Spring Board“. 4. 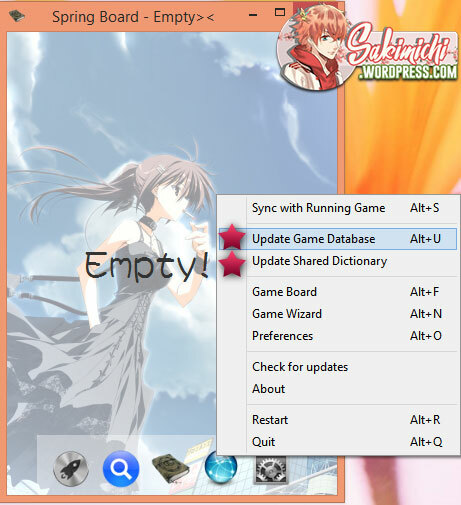 )Right click on the Spring Board and click “Update Game Database” then “Update Shared Dictionary”. There will be notifications on the right side if the update is done. 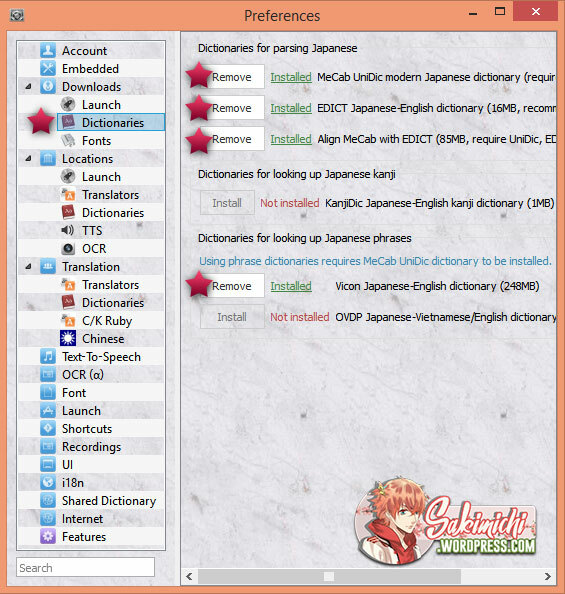 Download dictionaries if you are planning to learn Japanese with VNR and you want to look up at the terms. It is important to enable LEC and ATLAS offline translation. Both have their own advantages and disadvantages. LEC is almost perfect in slangs while ATLAS is almost perfect with simple sentences. I disabled all online translation services because my internet connection is slow. This is my setting in order to learn Japanese with VNR. It’s up to you on how you want your game text to look like. For custom font color settings, I made sure ATLAS and LEC colors are different so it’s easier to distinguish. 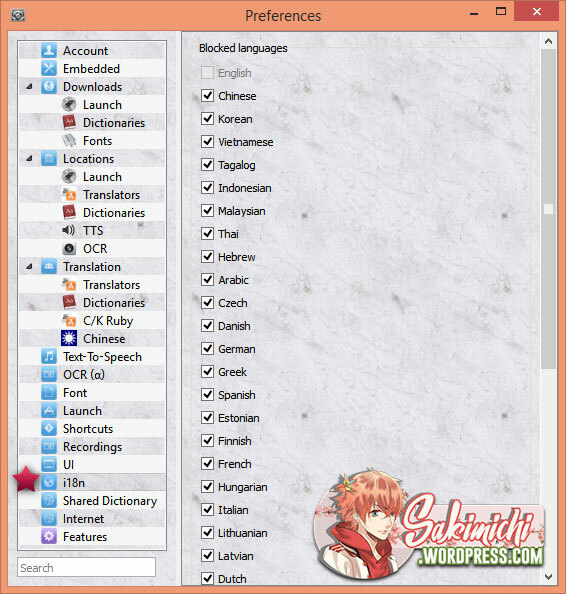 I disabled the rest of the languages that I don’t need subtitles/dictionary terms from. I disable VNR embed subs when I’m playing games with Pencil Engine. This is optional. VNR switches to ITH when you disable this. Now, if you are a translator/dictionary helper please proceed to step 6, if not you can skip this and proceed to Chapter 3 of the tutorial. 6. )We need to identify ourselves as a fansubber/translator/dictionary helper. Click and log-in using your Sakuradite account. Log-in and close the preferences window. 7. )Choose the language you want to work on. I chose “English” because I do Japanese to English translation. Close the preferences window. 8. )A notification will appear on the right side of your desktop afterwards. 1.) Go back to your “Spring Board” and click the “Game Wizard” icon. 2.) Click “Next“. Now before proceeding, it is better to have your game already running, so go back to your desktop and open your Otome Game or any Japanese Visual Novel, skip the brand credits and cool song/movie opening until you reach the games’ Title Menu Screen. Do not play in full screen. 3. )Go back to the ”Game Wizard” and choose “Select the window of the running game (recommended)” then click “Next“. 4. )Click “Start”. 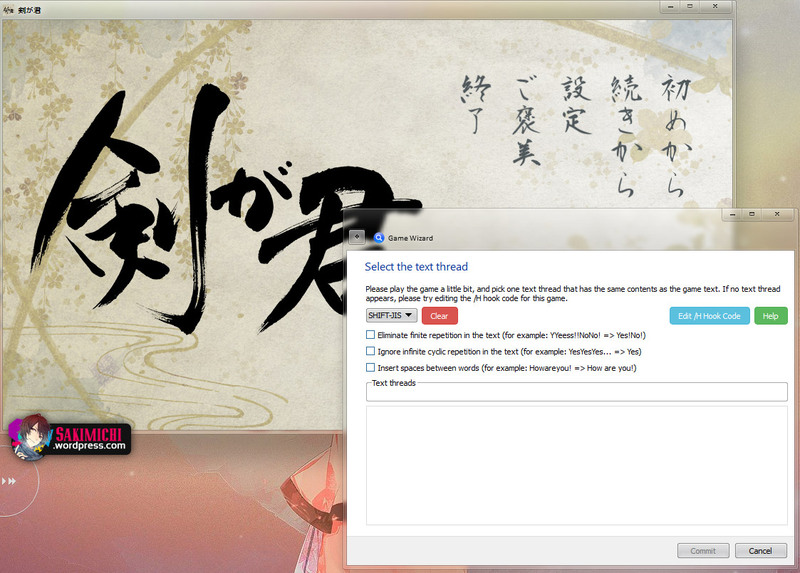 Select the game window of your visual novel. Click “Stop”. 5. )If the result of the game window is “Found” click “Next”. If not, use another method like selecting running process or selecting the game directory itself. 6. )Confirm the game information by clicking “Next“. 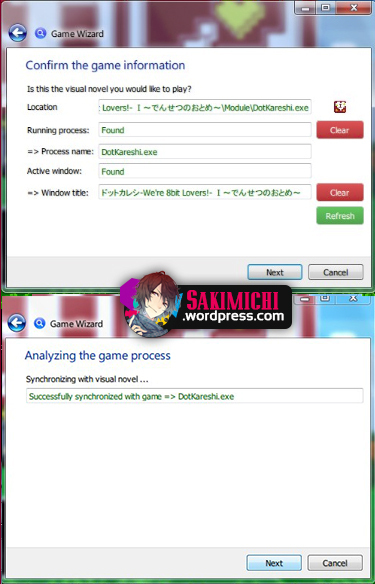 The Game wizard will now synchronize with your game, if it is successful, click “Next“. It will then search for the game settings online–it copies the settings of other players who started the game before you. 7. )But wait, what if there was no online settings found? Select text thread dialogue should appear. 8. 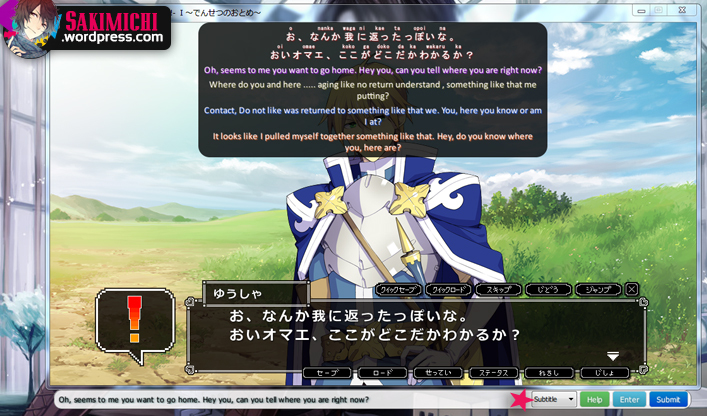 )Skip to the part where characters are talking and match the detected game threads to the game. Click “Commit” and you’re done. It’s time to post your translation! But if you’re not interested in translating, proceed to Chapter 04.5:The commoners manual. 1.) The game window should now look like this. 2.) Let’s call that blue menu on the right side “Side Controls”. You hover your mouse to the left side of the game window to hide/unhide it. 3.) Click on “Sub” on the “Side Controls” , and something should appear below. This is the “Comment Input Bar”. 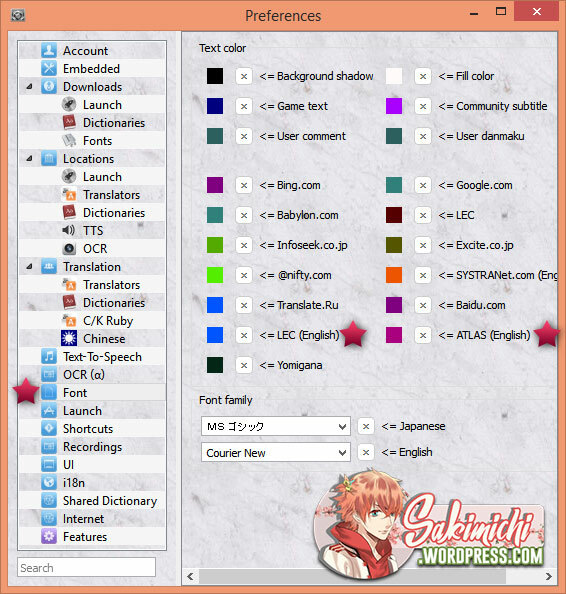 This is where you shall type and submit your translation. 4. )Proceed to the part where the characters are talking. That black box above your character is called the “Subtitle Box”. This is where your translation would appear after submitting, as well as the text of the character who speaking. 5.) Type the translation in the “Comment Input Bar”. Select “Subtitle” from the dropbox and hit “Enter” key. Do not select Danmaku please….unless it’s a sound effect. This is a common mistake for translators. Congratulations! You have submitted your first spell translation. From now on, use the Springboard. 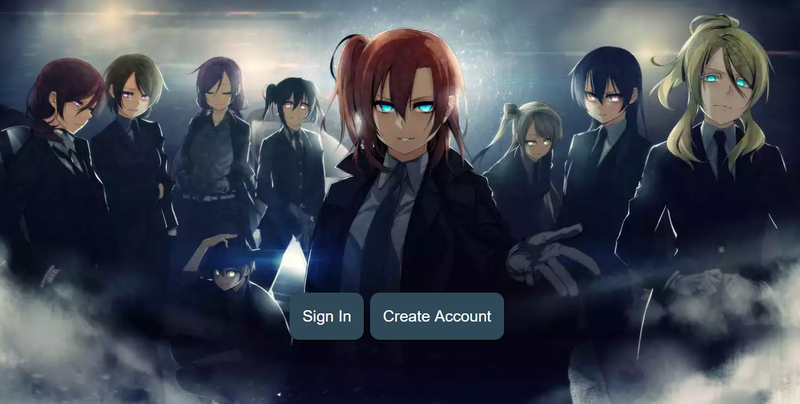 It will summon your Visual Novel with Visual Novel Reader. 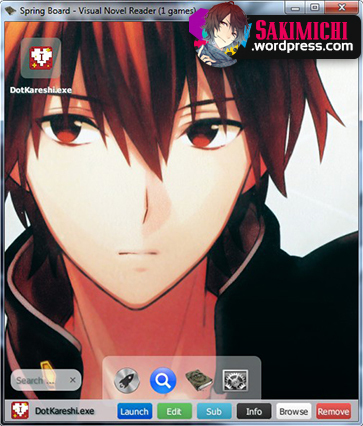 To put it simply, the Springboard is now your desktop for your Visual novels. 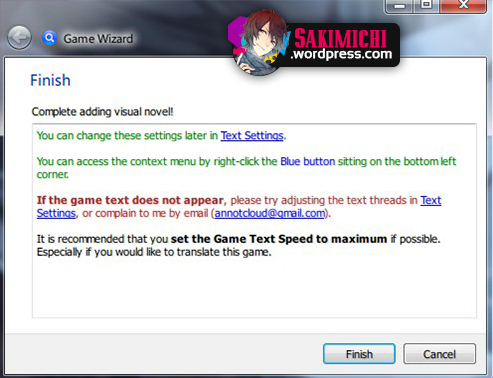 Want to learn more features of VN reader? Check the new tutorial here. In this section we skipped how to add translation and merely use VNR as a translation tool. This is for the common folk. 1. )The game window should now look like this. 2. )Let’s call that blue menu on the right side “Side Controls”. You hover your mouse to the left side of the game window to hide/unhide it. 3. )Go back to your game, proceed to the part where the characters are talking and a black box will appear above. Call it “Subtitle box”. 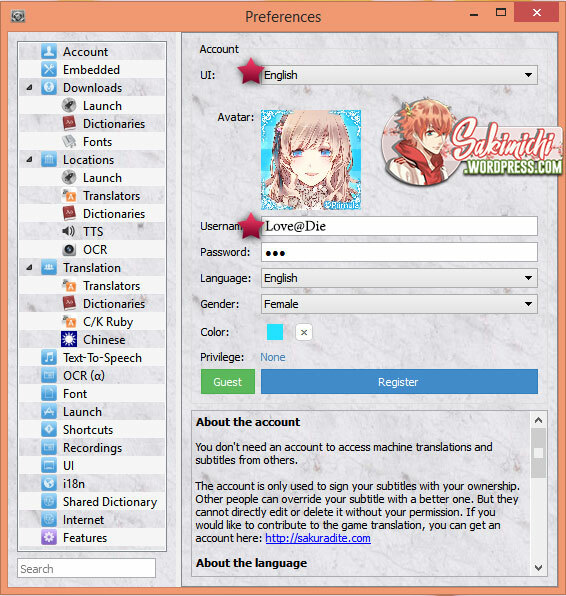 This is where all offline translations and user-submitted translations will appear. You can move it by clicking and dragging the space beside the music note. Moving the box That was quite simple eh? 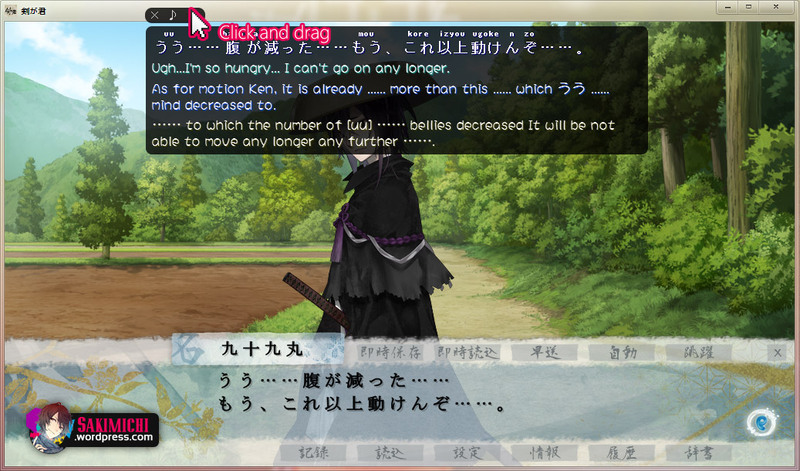 This usually happens if the visual novel text is not detected. 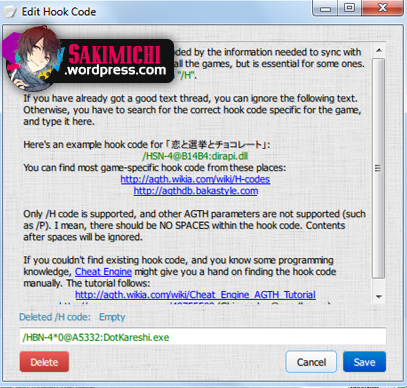 For complicated game setup like Dot Kareshi that requires an H-code, add the H-code by clicking “Edit H-code” tab. This would appear. Note that the latest otome games dont need this. You’d see something like this. As you can see there are several boxes in the screen. 1.3) Choose the right box that contains the character dialogue by clicking “dialogue” and disable others by clicking “ignore”. Congratulations, subtitles will now appear. 2.) I cannot register an account. Go to Aniclan to register. 3. 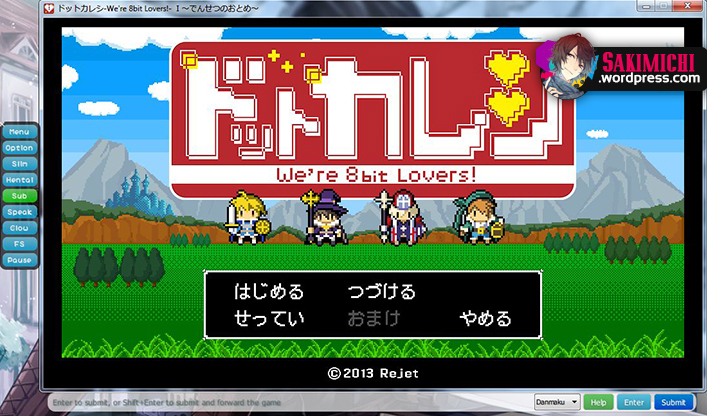 )I can’t see Japanese translation, only the game text is seen in the subtitle box. In the side menu preferences > options >machine translation-should have a blue square. Go register for an account to post. Click “Topics” and create a thread there. 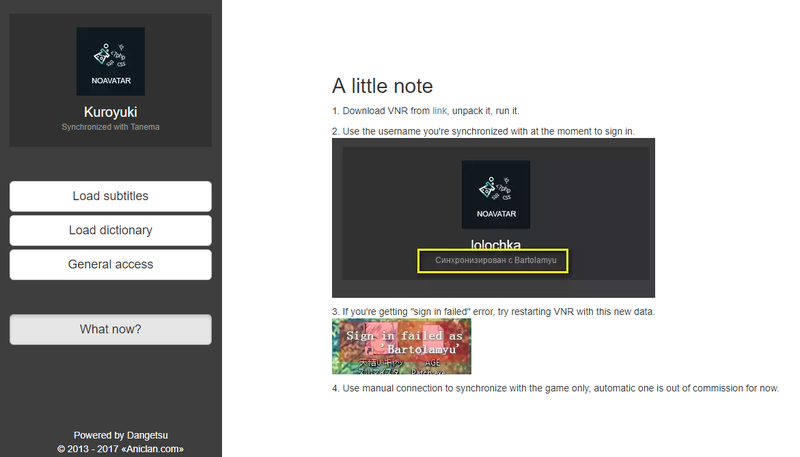 I do not like people copy pasting this tutorial at their site/forum. I prefer, you link back to this tutorial instead. Appreciate the guide, thanks for the work you put into this. Please do tell me if there is any way I can contact you in private, like on discord for example. Would love to have a chat. Again, atm words are the only things I can offer to you but thanks, for now it seems to work for me. a everything went great so far…..but how do i install lec..??? Anyone knows how to add google trad as the machine translation ? I think it’s better than atlas in the end. But how do i hook the text from the game and directly translate it trough google trad ? I downloaded the VNR from the given link and also ATLAS and LEC (installed both). After that I ran update.exe. Then I double clicked on the exe file for VNR, but it won’t launch. I waited for almost 10 minutes without clicking anywhere but it still didn’t begin to run. Please help with this. 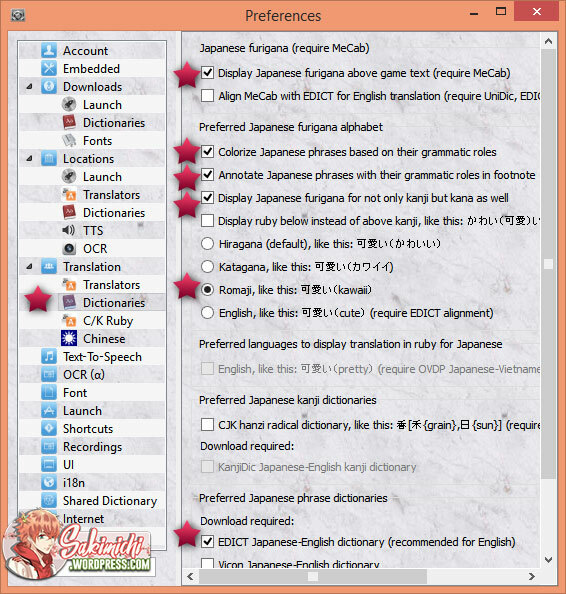 why i cant install vicon japanese-english ? © Sakimichi and Adumbrate and Resilent Love, 2011-2014. Unauthorized use and/or duplication of this material without express and written permission from this blog’s author and/or owner is strictly prohibited. Excerpts and links may be used, provided that full and clear credit is given to Sakimichi and A & R Love with appropriate and specific direction to the original content. The images used are owned by their respective owners; we don't claim ownership unless otherwise stated. This is a non-profit blog, it's made by fans for fans.